See Mars in the Night Sky! Simply go outside and look up, contact your local planetarium, or look for a star party near you. That is the point in Mars' orbit when it comes closest to Earth. Mars will be at a distance of 35.8 million miles (57.6 million kilometers). Mars reaches its highest point around midnight -- about 35 degrees above the southern horizon, or one third of the distance between the horizon and overhead. Mars will be visible for much of the night. By mid-August, Mars will become fainter as Mars and Earth travel farther away from each other in their orbits around the Sun. 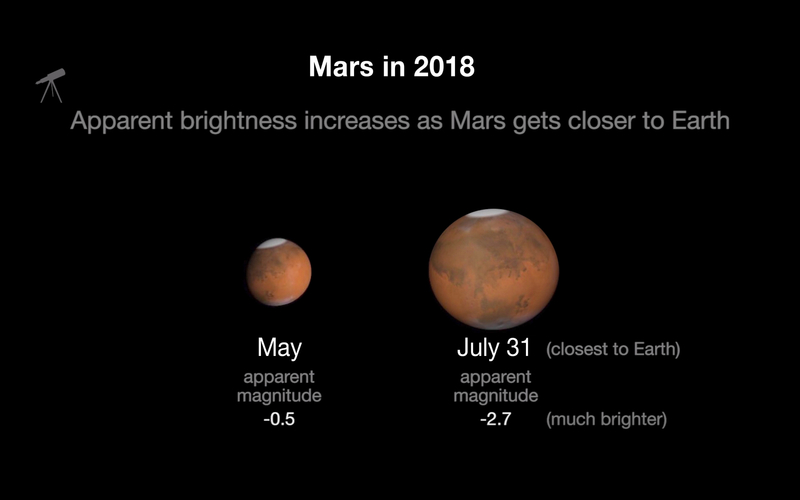 Miss seeing Mars Close Approach in 2018? The next Mars Close Approach is Oct. 6, 2020. You need a iFrames Capable browser to view this content.